Ankara is angered by Washington’s support for Kurdish fighters in Syria in the fight against [the so-called] Islamic State group [IS]. 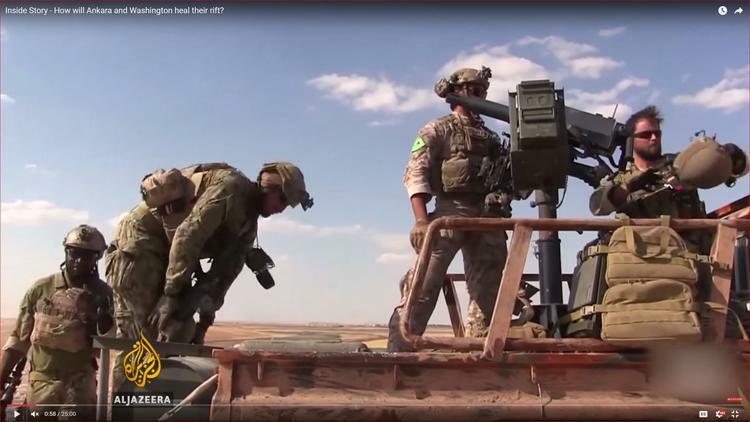 Turkey is offering to “join forces” with Washington for a special operation inside Syria on the condition that the United States does not include the latter’s closet ally against the Islamic State group: a Syrian Kurdish militia blacklisted by Ankara . Such a coalition could “easily” head to [IS]’s de facto capital in Raqqa, said Foreign Minister Mevlut Cavusoglu. “The subject we are discussing with the Americans is the closure of the Manbij pocket as soon as possible … and the opening of a second front,” Cavusoglu said, referring to a backdoor border route favored by IS for smuggling jihadists in and out of Syria. There was no immediate reaction to the proposal from the United States, whose strategy for fighting jihadists inside Syria is pinned on its Kurdish-Arab alliance, the Syrian Democratic Forces. The SDF is still dominated by the Kurdish People’s Protection Units, or YPG, which Turkey sees as the Syrian branch of the Kurdistan Workers Party, or PKK, which has fought a three decade insurgency against the Turkish state. Some experts believe the U.S. pushed for the creation of the SDF to get around the appearance of arming a group aligned with the PKK, which the U.S. State Department labels a terrorist organization. Cavusoglu said Syrian Arab opposition forces opposing the regime of President Bashar al-Assad could be backed by special forces from Turkey, the United States as well as France, Britain and Germany.